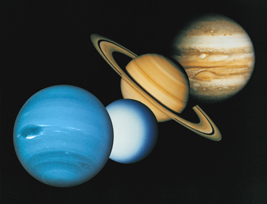 The four largest planets of our Solar System are collectively called The Gas Giants. They have similar structure and are in contrast to the smaller, rocky planets of the inner Solar System often called The Terrestial Planets. These images are from the Voyager missions and show the never-before-seen detail captured by the Voyager cameras.